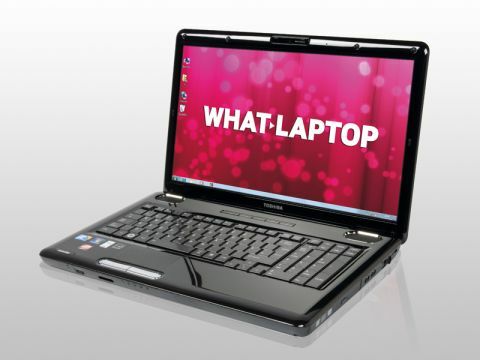 The Toshiba Satellite L555-10R is a powerful and affordable desktop replacement system. Performance stands out for the money and, although there are some minor issues with build quality, we can happily recommend it as a competitive laptop. The large 17.3-inch screen dominates this laptop, being very bright and, thanks to the 1,600x900-pixel resolution, it's very detailed. The widescreen 16:9 aspect ratio is suitable for watching films on and the glossy Super-TFT screen coating doesn't cause too many distracting reflections. The chassis looks great thanks to a glossy, patterned design, but it quickly attracts fingerprints. Despite detecting a little flex, the chassis panels are relatively well put together, but the laptop palmrest does get hot quite quickly. It's not uncomfortable, but it is worth noting. The keyboard is large, spacious and generally provides a fluid typing action. The keys travel a comfortable distance, but are very flat, meaning that unless you're a very accurate touch-typist you may find it occasionally hard to differentiate between the various letters. The dedicated numeric keypad will suit those who regularly input data. Sadly, if you have large hands it's all too easy to brush the touchpad during typing, causing the cursor to behave erratically, which is irritating. The Intel Core 2 Duo processor is accompanied by 4096MB of memory to provide excellent performance, and you'll have no problem concurrently running multiple office applications such as word processors, and more resource-intensive programs such as video editing suites. A powerful ATi graphics card is included, and we were impressed by the 3D power the laptop produced. You'll be able to edit your photos and even play the latest games without too many issues. Portability isn't this machine's strong point, and the 3.1kg weight makes it uncomfortable to carry round on a regular basis. Short trips around the home shouldn't prove too problematic, however. The 133-minute battery life is also limited, but this is to be expected somewhat, considering the Toshiba's power and size. 802.11n Wi-Fi is included and is the latest in wireless networking technology, while the 10/100 wired Ethernet module is slightly older. Three USB ports grace the chassis, alongside an eSATA interface for transferring data at very high speeds to an external hard drive. There are also VGA and HDMI output ports in place. We like the Satellite L555-10R. There are a few niggles, but performance - especially 3D - is good for the money and as long as the warm palmrest doesn't put you off, this is definitely worth a look.